Every business will need to take steps to be more resilient to climate change, they may be small adjustments or large changes. The greater frequency and intensity of extreme weather and chronic climate impacts impose real costs on communities and companies. Extreme weather causes property damage, disrupts business operations, and affects global supply chains across the economy. Sectors more closely tied to natural resources, such as agriculture or tourism, are particularly vulnerable to changing climate conditions. The re-insurer Munich Re estimates that natural disasters (most of which may be influenced by climate change) caused $340 billion in losses in 2017, with 83% of those losses coming in North America which had a particularly devastating hurricane season that year. 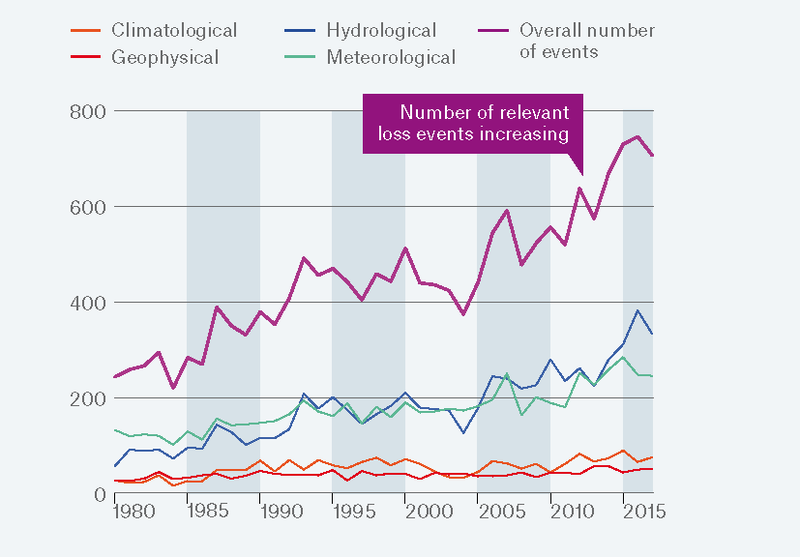 Data from the company shows that the climate-related disasters are on the rise around the world. Companies have always navigated a changing business environment. But now they face a changing physical environment, as climate change affects their facilities and operations, supply and distribution chains, electricity and water supplies, communities where they are based, and their employees and customers. In addition to the added risks of climate change, companies are expected to adjust for market opportunities that can be presented by changing needs for more climate resilient crops, materials, and technologies to support climate change mitigation and adaptation. Source: Munich Re “TOPICS Geo: Natural catastrophes 2017,” https://www.munichre.com/site/topics-online/get/documents/mr/assetpool.shared/Documents/5_Touch/_Publications/302-09092_en.pdf. A first step in preparing for climate change impacts is to assess how they will affect your business, and a growing number of companies are undertaking vulnerability assessments that consider future climate conditions. We find that nearly all companies in the S&P Global 100 Index have identified risks that changes in the climate pose to their business, and most are taking action to reduce these risks. Moreover, many of the world’s largest companies see business opportunities in climate change as well. 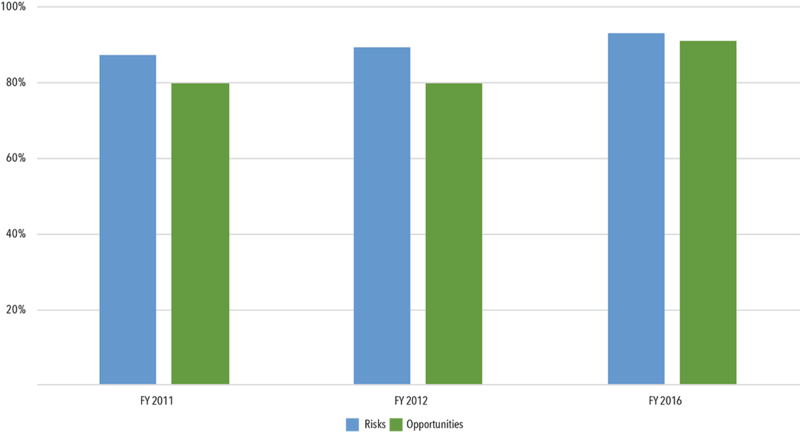 Source: C2ES analysis of company responses to CDP questionnaires for fiscal years 2011, 2012, and 2016. Companies analyzed were members of the S&P Global 100 Index in 2012. Recently released guidelines, developed by industry, help to advance climate preparedness among corporations. When companies implement the recommendations from the Financial Stability Board’s Task Force on Climate-Related Financial Disclosures, they can better understand their climate risks. This allows them to better manage those risks, and gain access to capital because of their greater transparency and management. To address these vulnerabilities, companies often adjust existing business planning processes. For example, California utility Pacific Gas and Electric has an internal climate science team that serves to integrate the latest climate science into the company’s risk assessment processes. It has also updated its emergency response plans and infrastructure investment plans to account for changing climate conditions. The insurance industry has unique exposure to climate risk, particularly re-insurers, as they take on much of the growing cost of an increasing number of disasters and share climate risk. They also often have a sophisticated understanding of potential climate impacts and can inform company resilience measures and investments. In anticipation of these increased risks related to climate change, some insurance companies are investing in resilience, and tying demonstrated resilience measures to lower premiums. Insurer Swiss Re has explored catastrophe bonds to help manage financial risks associated with natural disasters, and connecting the bonds to resilience projects that manage the physical risk. Unlike large businesses, many small businesses do not have the capacity to develop climate scenarios or examine climate risks they face. They may not have plans in place to respond and recover from weather events which makes them particularly vulnerable. For example, a study of businesses affected by Hurricane Sandy found that about half of them experienced a loss in revenue after the storm. Small businesses also tend to be unprepared for long-term impacts that could affect their employees, materials, supply chain or other elements of their business. Nonetheless, there are steps they can take to improve their resilience to climate change, such as increasing their insurance coverage, disaster recovery plans, adding onsite energy resources like combined heat and power (CHP) systems or rooftop solar installations. Small businesses can also be key participants in municipal resilience activities, for example by hosting water retention installations (green roofs, bioswales, etc.) or communicating preparedness information to employees.